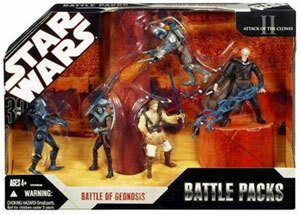 Description Of Item: The Battle of Geonosis Battle Pack includes 5 unique 3 3/4-inch Star Wars Action Figures and accessories from the film Attack of the Clones. Relive the arena showdown with Obi-Wan Kenobi, Count Dooku, Aayla Secura, Jango Fett, and the Super Battle Droid. Figures include lightsabers, blasters, Sith lightning, and more!